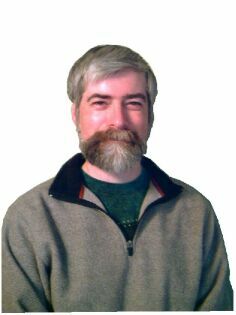 My name is David Robertson and I have been smithing for over 20 years now. Whew, time does fly! I started back in 1987 with no idea of what I was doing and a need to do everything I did on a tight budget. I started as a hobby which grew into a hobby business, which followed into a full time business. My smithing was at the hobby business stage while I was training as a geological engineer. When I left school I still needed to pay the bills and engineering jobs were not just around the corner so blacksmithing became full time. After 20 years I still get a thrill from taking raw material and transforming it into something both useful and elegant, and I expect my work to last long after I do. 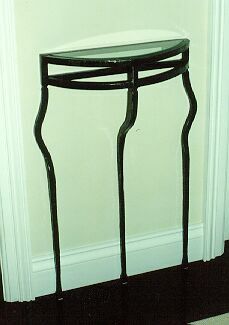 Few other mediums are so elegant and long lasting. Consider this book a good solid foundation to start to explore smithing. I have made lots of mistakes over the years but have found that a few good books have helped me along the way. When I was starting out I would have loved to find a book like The Fundamentals of Blacksmithing. I wrote it with the beginner in mind. It is clearly written and illustrated for novice blacksmiths. This is not a series of projects to try your hand at. 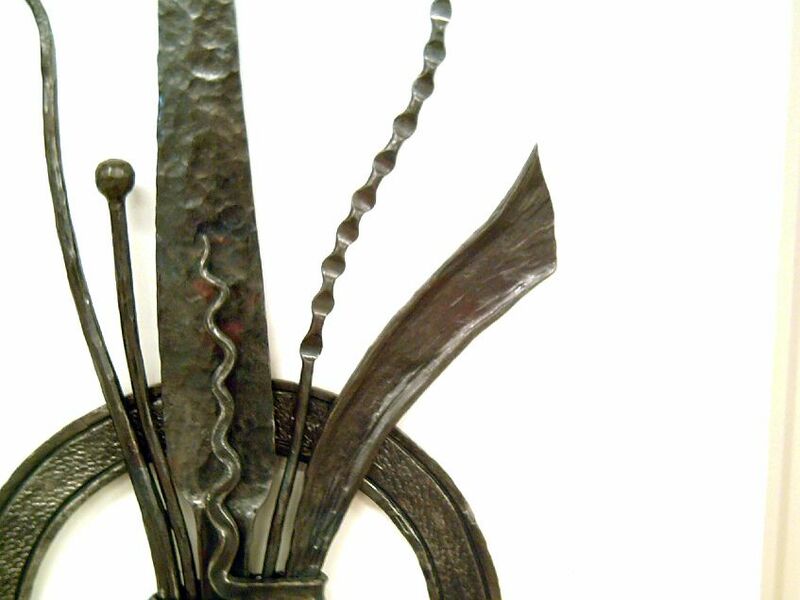 It is a series of techniques that build on each other to develop your skills as a blacksmith. 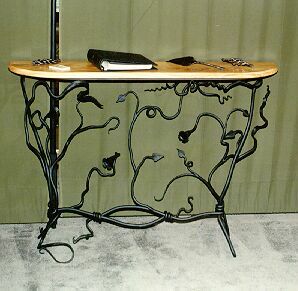 The techniques can be incorporated into larger projects as you master them. Included are plans for a small coal forge, and a small gas forge. 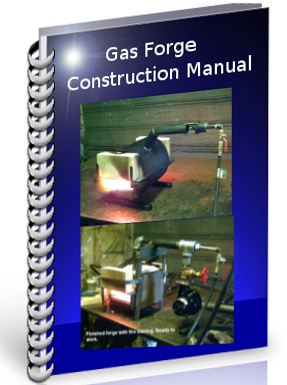 If you are truly interested in building a gas forge I would suggest that you look at my Gas Forge Construction dvd . The video goes into much more detail than the plans in the book and shows the step by step process that is involved. Please be aware, you use any information in this book at your own risk! Smithing itself has inherent risks with it. Open flame, hot metal, bits of metal flying around just to name a few. As we all know, anything rewarding has a certain amount of risk to it. Take precautions and you can develop an excellent hobby. Smithing has seen a new dawning age in the past few years. It is a hobby that both men and women are taking up and some are turning it into a new career. It requires a smaller budget to start than many other pastimes, and can (at least in the beginning) take up a smallish amount of space. The ebook is broken down into chapters that roughly follow my Basic and Intermediate Blacksmithing Courses that I offer at my shop. 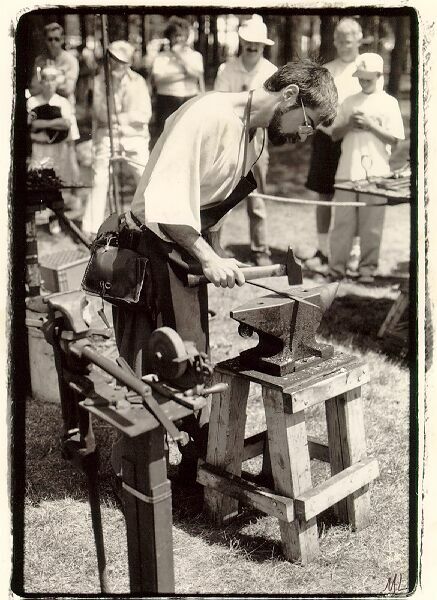 I do strongly feel that nothing replaces one on one instruction in the finer points of this craft, but if you are looking to test the waters in this ancient art The Fundamentals of Blacksmithing is an excellent place to start. Heat Treating .....and much more! How to build and maintain a proper coal fire. The basic tools you wil require. How to taper, and shoulder. How to twist and make scrolls. Effective drawing out and hot cutting. Hot through punching, and splitting. How to upset a bar, and make leaves. Forge welding and making tongs. 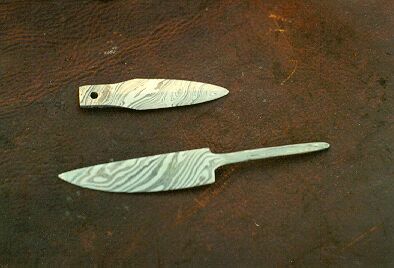 How to work with tool steel and how to make hand forged knives. and many other tips and techniques. The ebook also discusses elements of design of a project such as balance, movement, flow and tension. With these fundamental techniques you will save hours of doing it the hard way, trying to re-invent the wheel. 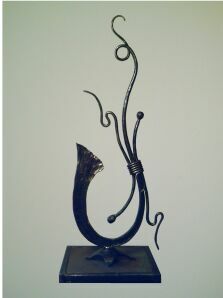 There are many ways of reaching the same goal in blacksmithing. Some are just faster and easier than others. If you have developed an interest in blacksmithing and are trying to decide to jump in or not the book guides you through shop set up and what to watch out for and how to save money. One the great things about blacksmithing is that you can make many of your own tools. 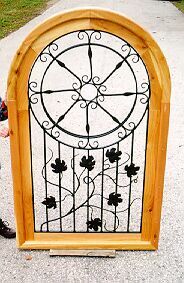 You reap the benefit of learning skills when you make a tool as well as just paying the low cost for the steel. All of more difficult projects are based on these fundamentals. In process you design your finished piece on paper and then decide what techniques you will need for each element. Develop skill with that technique on sample pieces then build your project. Sounds simple and really it is. The only catch is that it takes time! The Fundamentals of Blacksmithing acts as a good refresher course for those who have done some smithing but may have gotten a bit rusty on some techniques. Included is a resource section which will help you locate hard to find items. You will find smithing a rewarding and surprisingly relaxing hobby. I have had many retired folks take it up as hobby for the combination of the physical activity, the rewards of producing something beautiful and useful, and it helps to keep the mind sharp as you are always trying to figure out the next project. When you invest in this ebook that entitles you to free updates. I will email you when I update the book and provide you with the new download link. You only have the one time investment and a perpetually updated book. Now thats good value for the money! Clickbank sells our products - they are a trusted online retailer specializing in digitally delivered products. Your credit card statement will show a charge from Clk*Bank.com for $28.00 US. I have decided to put the ebook on sale for members only for a price of $19.97 US. This is a 29% savings on this book that will help you get started in this age old craft. You can become a member by filling in the form below. Be Sure To Check Your Email or Spam Filter For Your Login ID and Password. To activate your account you must click on the confirmation link sent to you in your email. To get your savings you need to log into the Members Area and go to the Member's Discount area to buy your book, otherwise you will pay the full price through the link below. You will need Adobe Reader to veiw the document in its pdf format. Adobe reader is a free download and can be obtained here. After you have a copy of Adobe Reader you will easily be able to veiw the document and save it to a location on your computer. The file is about 3 Mb in size and download time will vary with your connection speed. I live in the country with only dial up available and it takes me about 6 minutes to download it. Of course with high speed and it will only be a few moments. 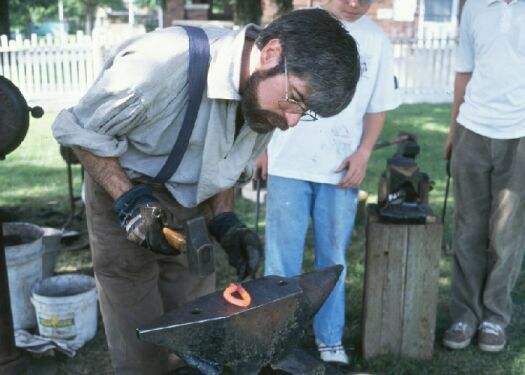 Download The Fundamentals of Blacksmithing Now! by clicking the link for regular price of $28.00 US. PS if you are interested in a Library of other informational books Click Here. Once you pay on the Clickbank Page you will automatically be taken to the download page. This may take 5 seconds. If by chance you do not recieve your ebook just email me as I have a record of your transaction, but it may take me a bit of time to get back to you. Don't Worry It Will Get Sorted Out! You must click on your confirmation link sent to you in an email to activate your account.